Rob was born and raised in Connecticut. He has lived most of his life there but may be released soon for time served. A former soldier and combat veteran Rob served in the U.S. Army Infantry and saw action in Korea, Iraq and Georgia (the state not the country). Since his end of service in 1992 Rob has worked in retail, firearms manufacturing, private security and most recently as a paralegal/office manager specializing in immigration law. Rob is currently unemployed. Rob is a huge videogame fan, reads a lot and loves movies. So basically, big nerd. He also sang in a band and owns a ton of home recording and video editing equipment. Techno-nerd. Rob has been a hobbyist writer for as long as he could write. Rob has been a professional web comic appreciator for many years. This is his first foray into creating one. 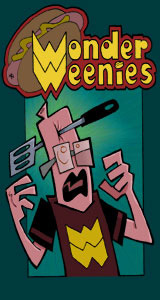 Corey Kramer is the cartoonist on Remedy and the writer and cartoonist for Wonder Weenies. Corey hails from the great white tundra that is Minnesota where, when not chained to his drawing table, he works as a counselor for troubled teens at a residential treatment facility. Corey is a 1996 graduate of The Joe Kubert School of Cartoon and Sequential Art, Inc. Apart from drawing funny pictures, Corey enjoys collecting vintage board games (and finding ways to store his 400+ collection), collecting Batman paraphernalia (and deciding which pieces to display in his studio and which to store until his underground lair has been completed), collecting and playing vintage video games (and adding new homebrew games to his Atari 2600 collection), acting (which he doesn't get to do nearly enough), and making custom Heroclix or action figures (which he finds less and less time to do). Chadm1n is a midwest transplant who grew up in places far west of the Mississippi. He is a licensed pilot, a former U.S. Air Force Technical Sergeant (E-6), and currently works as a technology director. Chadm1n holds a Bachelor of Science degree in Computer Science and is a RedHat Certified Engineer. If you have questions about technology, Chadm1n probably has an answer; however, he doesn't do Photoshop!